Thread: [posted] Just Another Infinity Mirror? It all started back in college, some years ago. Living in a house with some friends, I wanted the parties we threw to be the best, the very best, the best there ever was. It began as a simple volume sensor and a non-individually addressable RGB LED strip hooked up to an Arduino Uno. Then I incorporated an MSGEQ7 and aux input. Then I graduated, got a job, and could afford the ws2812 LEDs that I had been wanting to use. 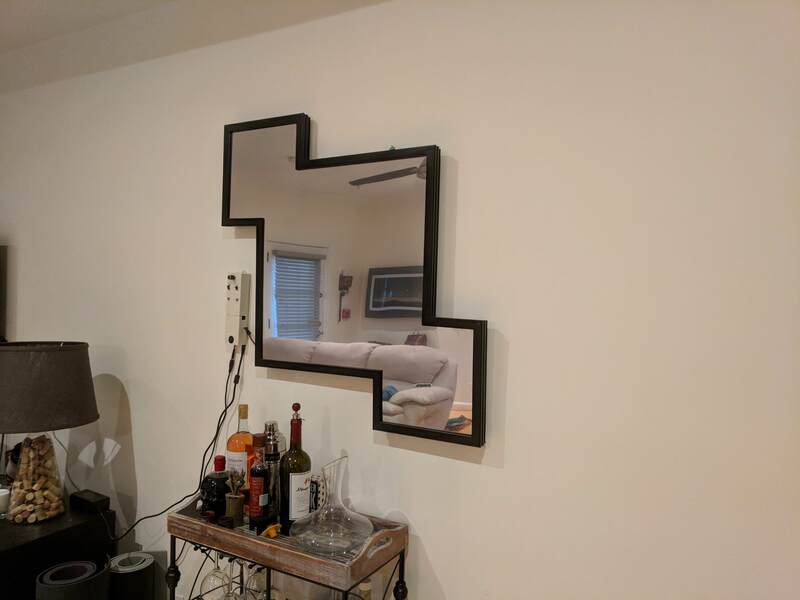 I made this same squares design on the wall by hanging the strip on a bunch of nails and when showing it to someone, they go, "you should make that in to an infinity mirror!" And the rest was history. What made me switch from the Arduino to a Teensy is when I gave each LED an X and Y coordinate. The Arduino's memory could not handle 2 more 270 value arrays, and I'm glad it couldn't. While I struggled to get everything working on the new board, because I struggle at everything tech, Teensy's much better specs, audio shield, audio library, OctoWS211 library, and did I say specs? have allowed me to do so much with this project. Upgrading to the 3.6 was another move that I'm glad I made. Because of the increased processor speed, the designs I've programmed can go over twice as fast as they could on a 3.2! It also gives me the piece of mind knowing that if I want to program much more complicated music analytics, the Teensy should be just fine. This is still a work in progress but I finally reached a point where I felt comfortable posting a video of it. Kind of unrelated, attached is a picture of a civil war fort I found at Harpers Ferry, WV that is in the same shape as the mirror I made! This certainly looks interesting. Where's the video? Thanks Robin! I saw when it went up but haven't made it here yet. I've been working on this project for a while now and have a new video here. I don't know if the blog post needs updating but I thought I'd share it anyways.